As far as the job market is concerned, the economy is stuck in neutral. Even if the economy is growing, progress on the jobs front has slowed to a halt. For Americans who are currently seeking work that will mean continued pain. According to the latest Bureau of Labor Statistics payroll survey, employers added only 18,000 jobs in June, not much different from the revised estimate of 25,000 new jobs in May. The news from the household survey was even worse. The number of employed adults fell 445,000 in June, boosting the unemployment rate from 9.1 percent to 9.2 percent. The jobless rate has now risen by almost half a percentage point since March. Taking a longer view the numbers look better, but not much. Since December of last year the employer survey shows job gains of 126,000 a month and payroll gains in the private sector of 158,000 a month. Government employment has been declining, and it continued to fall in June, offsetting some of the employment gains in the private sector. The household survey shows slower job gains so far this year. Respondents in that survey report employment gains of just 21,000 a month. For purposes of comparison, the nation needs to add about 105,000 to 110,000 jobs a month to keep the unemployment rate from rising. The employer survey shows we have slightly exceeded that benchmark since the beginning of this year. The household survey shows we have fallen short. Revisions in the two data series may eventually reduce the apparent inconsistency. The crucial point, however, is that neither indicator shows a pace of job creation that is fast enough to reduce the nation’s unemployment rate very quickly. If the jobless rate were 5 percent, this news would be tolerable. 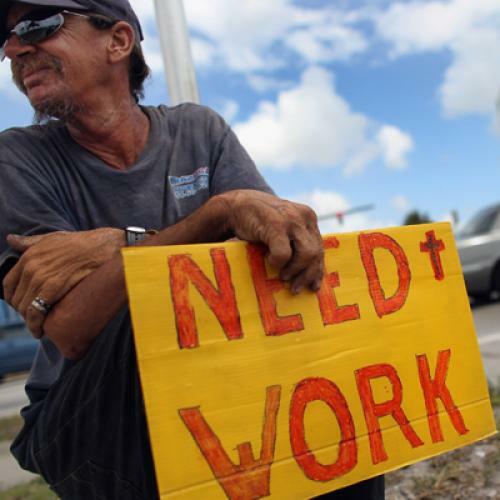 But when unemployment exceeds 9 percent, it should be unacceptable. Even taking a rosy view of employment gains over the past 6 or 12 months, it will be many years before the nation eliminates the current shortfall in jobs. To bring the adult employment rate back to its pre-recession level, we would need to add about 11 million new jobs. At the pace of job growth we have seen since the start of the year, that task may take decades.